This small city in Chihuahua state is named for the revolutionist Miguel Hidalgo y Costilla, but is often called simply Parral, which is also the name of the river that runs through it [see map]. Parral is 301 km (by rail) south of Chihuahua (city), at the end of a 90 km branch of the Mexican Central Railway. It has been a mining center since the 17th century and was the place where Francisco ("Pancho") Villa was assassinated (in his automobile) in 1923. Population was 12,000 in 1900, is about 100,000 today. The system seems to have run only a short time - perhaps as little as nine months, not more than two years. 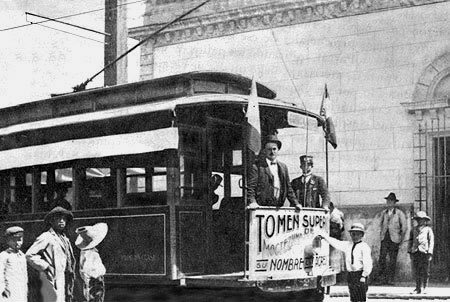 Modern Mexico of 20 October 1908 reported that a converter breakdown on 18 October shut the streetcar system down: " . . . A serious accident which happened to the large rotary converter of the local electric streetcar company Sunday night has completely crippled the car service and no cars have left the barn this week . . . telegrams were dispatched to the [Westinghouse] factory in Pittsburgh for the necessary repair parts." If it never reopened, that means the system ran less than nine months and shut on 11 October 1908. 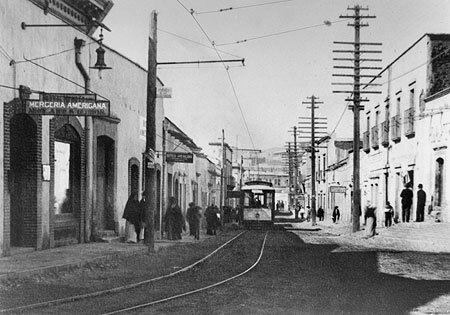 During the Mexican Revolution (1910-1920) Hidalgo del Parral's trolley wire was melted down to make coins. "Danville Cars for Mexico" in Electric Railway Review (Chicago), 18 January 1908, p. 100. Description of new trams, two photos. "New Cars for Parral, Mexico" in Electric Railway Journal (New York), 1 February 1908, p. 184. Description of trams, three photos. Modern Mexico (Mexico City). 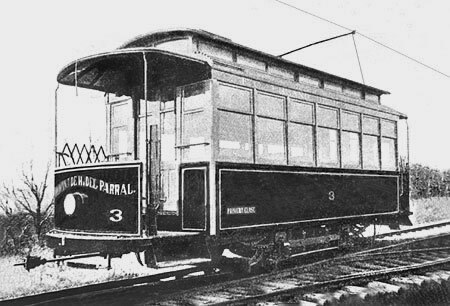 Short articles about the Parral tram system in 21 January 1908, p. 13; 28 January 1908, p. 11; and 20 October 1908, p. 14. Guillermo Porras. Hidalgo del Parral: Reseña Histórica. Chihuahua, 1946. A paragraph on p. 51 confirms the inauguration of the electric tram system in 1908. Rubén Rocha Chávez. Tres Siglos de Historia. Chihuahua, 1979. This history of the city shows two tram photos and briefly describes the system on pp. 218, 300 and 307. The two photos, from the author's collection, are reproduced on this webpage. The author would also like to thank Eulalio Fernández Espino in Hidalgo del Parral for the information that he kindly provided about the tramways of his city.